A while back I had gone to the WAG to see a local artist talk about encaustic painting. The presentation was fascinating and I couldn’t wait to try it out. I went ahead and ordered the materials I needed and for the last 8 months or so they have been staring at me in my studio. I have been feeling guilty about not having tried it out. Last Sunday I finally decided to give it a try. It was a lot harder than I thought it would be, but I did enjoy the process. I am not happy with my first piece but I guess I should give myself a break and realize that the first piece isn’t going to turn out perfectly. I will make sure to give it another try sometime soon. Due to the fumes that you deal with while doing encaustic I decided to take advantage of the beautiful day and I set myself up in my backyard on the deck. It was really nice to be outside on such a beautiful day and play with paint or I guess wax in this case. I thought I would share a bit of information about encaustic. 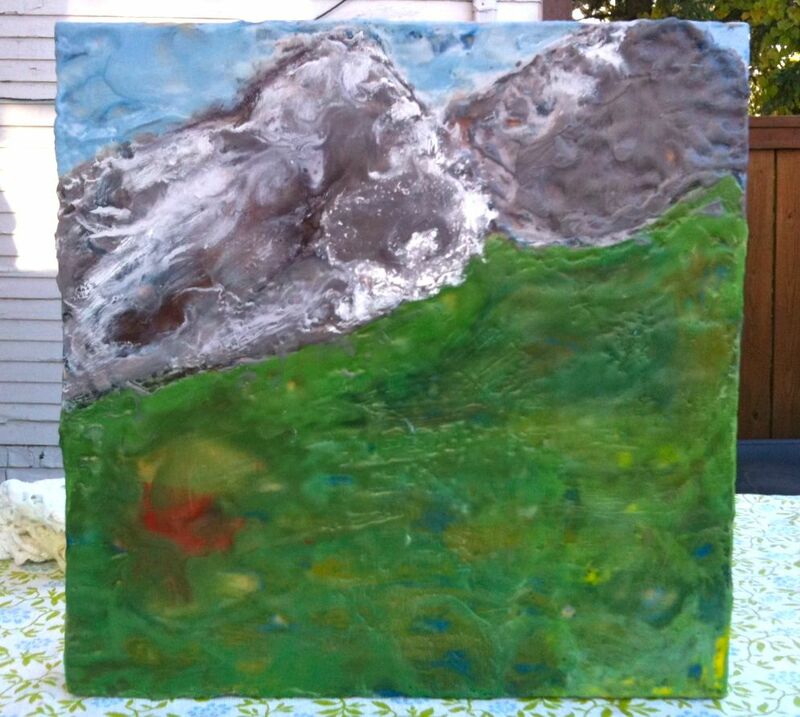 Encaustic is also known as hot wax painting. The term Encaustic is derived from the Greek word enkaien and means to burn into. This procedure of applying molten, coloured wax to various surfaces was already used by the old Egyptians more than 3000 years ago – the resulting paintings of the mummy portraits are there for us to admire in the British Museum in London or in the National Museum in Cairo. The technique was lost for hundreds of years, but rediscovered in the 18th century and has also had a resurgence in popularity since the 1990s. The liquid wax can be applied to wood panels or also canvas and other materials, and metal tools and brushes be used to shape the paint before it cools, you can also use heated metal tools to manipulate the wax once it has cooled onto the surface. You use a heat gun in-between wax layers to ensure that the new layer bonds to the existing ones. Not as easy as I thought it would be but for sure fun!